Multimeric assemblies defined in a structure's mmCIF file are automatically listed when the file is opened and can be reconstituted with the sym command. 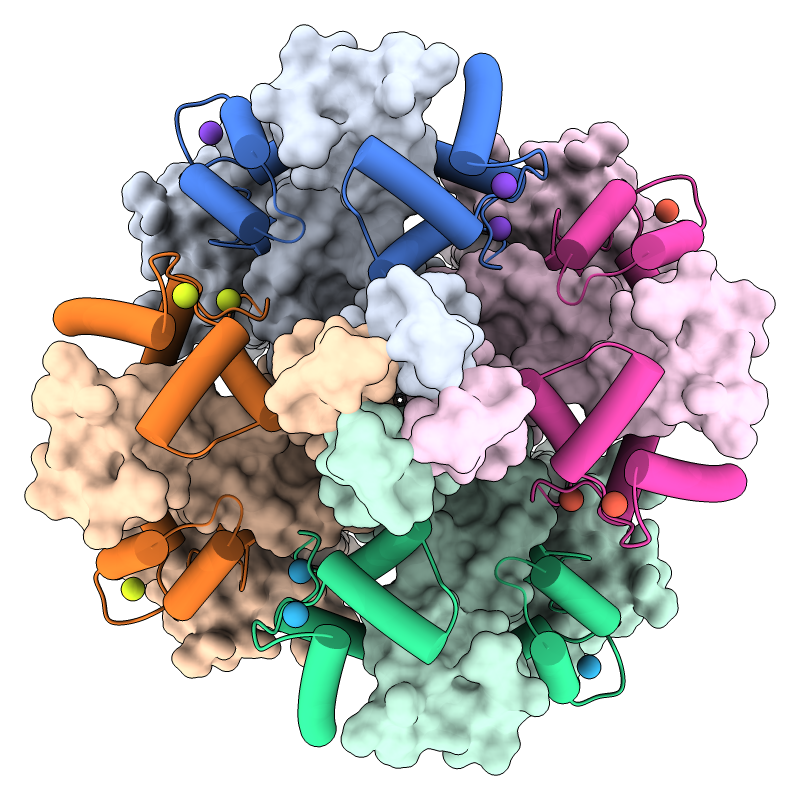 The complex of selenocysteine synthase and tRNASec (PDB 3w1k) is shown as molecular surfaces of different colors for different chains. The asymmetric unit is on the left and the assembly specified in the mmCIF file is on the right, with arrow and text annotations from 2dlabels. See the command file sym.cxc. KCNQ1 is the pore-forming subunit of a cardiac potassium channel. It binds to calmodulin, and mutations in either of these proteins can cause congenital long QT syndrome, a dangerous propensity for irregular heartbeats. 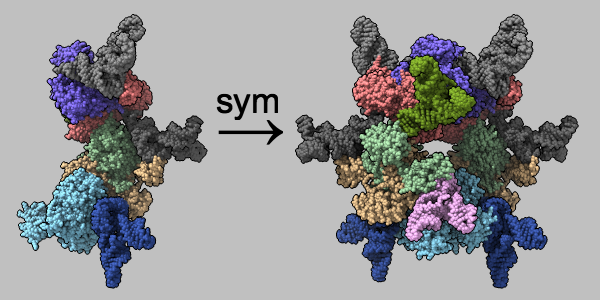 In the image, a structure of the KCNQ1/calmodulin complex (PDB 5vms) has been assembled into the native tetrameric form with the sym command. The view is from the cytoplasmic side, with KCNQ1 shown as surfaces, calmodulin as cartoons, and calcium ions as balls. A pastel palette from ColorBrewer has been used to color the surfaces, darkened with color modify for the cartoons, and “rotated” 45° in hue for the ions. See the command file colormod.cxc.